Romance is in the air and it’s time to say ‘I love you!’. Valentine’s Day is the perfect excuse to spoil some special to you. We’ve got a beautiful array of gifts that suit every kind of couple and whoever you’re buying for is bound to fall head over heels for any surprise hidden inside a Laings box. Valentine’s Day is a celebration of love and this year why not get swept away in the romance! This is your chance to spoil someone who you truly cherish. Whether you’re enjoying the initial flutter of a new relationship, or your romance has seen many Valentine’s Days, make this year one to remember with a beautiful and luxurious gift. 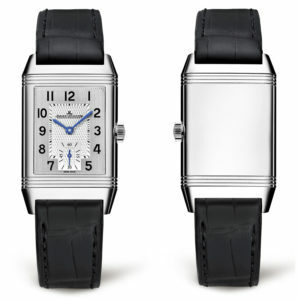 The rotating steel case-back of Jaeger-LeCoultre’s Reverso range was originally designed in the 1930’s to prevent damage to the precious sapphire crystal glass during polo matches. Now though you can use the unique trick to add your own note of love, by engraving a personal message onto the case back. Elegant and sophisticated you can wear your heart on your sleeve with this romantic timepiece. This JAEGER-LECOULTRE REVERSO WATCH is a classic and refined timepiece, with Arabic numerals and a smart black alligator strap. The art deco design creates a distinctive look and with your own message engraved on the case-back this is the perfect present for Valentine’s Day. If the one you love is lucky enough to have a glittering engagement ring from our exclusive Family Collection a gorgeous piece of jewellery from the same range is a really romantic gift to receive. Each range features a selection of perfectly matching items that will beautifully complement her existing glitter. This stunning ANNA 18CT WHITE GOLD 0.77CT DIAMOND PENDANT is a truly glamourous gift that looks amazing with a ring from the same collection! 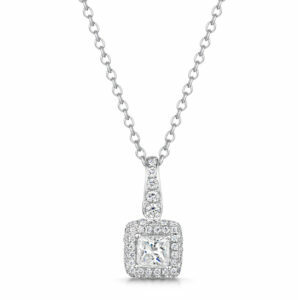 The centre princess cut diamond is framed with a dazzling cluster of smaller round brilliant stones, creating a irresistible charm. To celebrate the month of love we’ll be donating £50 from any purchase from the Family Collection to the British Heart Foundation – helping them to beat heartbreak forever. A gentleman can never have too many cufflinks and a luxurious pair are a brilliant gift that he’ll use again and again. With unique and quirky designs, as well as some timeless classics, there really is a pair of cufflinks to suit everyone. They’re perfect for a stylish gentleman and every time he wears them he’ll look down and think of you. 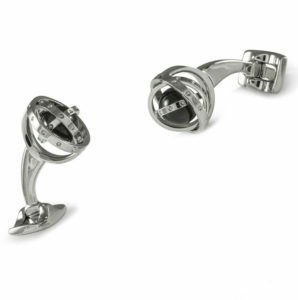 The DEAKIN & FRANCIS WHITE RHODIUM GIMBAL CUFFLINKS are expertly crafted in white rhodium. The set of three gimbals hold a stunning smoky quartz bead which spins freely with your movement. The small rivets around the outer edges add to the stylish, but masculine look creating an industrial aesthetic. On the most romantic day of the year why not make the ultimate declaration of love and ask that all important question. Make it a Valentine’s Day that she’ll never forget with a gorgeous engagement ring! We have an exquisite selection that she’s bound to fall head over heels for. It definitely beats flowers and chocolates. 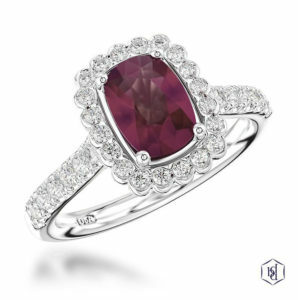 The DIAMOND BY APPOINTMENT PLATINUM 0.99CT CUSHION CUT RUBY RING is the perfect choice for a Valentine’s proposal. The enchanting red of the ruby wonderfully captures the romance of the day and the glittering halo of diamonds creates a truly sparkling look. It’s a ring that will always take her back to that extra special Valentine’s Day. Thank you for taking the time to read our Valentine’s Day Gift Guide! Follow our latest news on Twitter, Facebook, Instagram, YouTube and Pinterest, or if you have any questions please pop us an email at info@laingsuk.com.